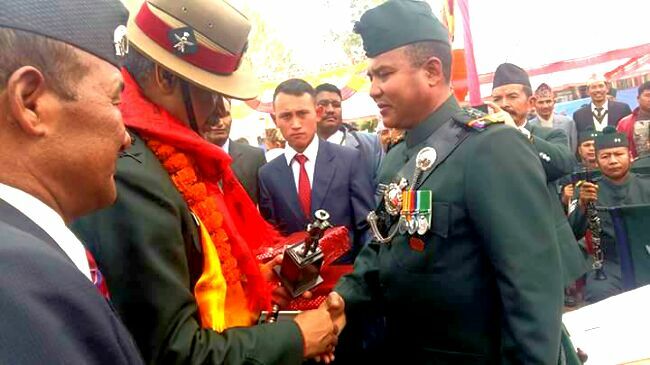 Gurkha soldiers of 9th Gorkha Rifles have celebrated a bicentenary event to mark the glorious 200 years of the services with pomp and gaiety at Pension Paying Office in Pokhara. The event was organized on Saturday under the aegis of Defence Wing, Embassy of India which is responsible for the welfare of all Nepal domiciled Government of India pensioners. There are approximately 90,000 Indian Army ex-servicemen and 36,000 paramilitary and civil pensioners settled in Nepal. The Government of India has been looking after the welfare aspects of these veterans since 1947. More than 3,500 ex-servicemen and families of 9th Gorkha Rifles participated in the event with zeal and enthusiasm. The event was attended by Nepal Army CoAS Gen Rajendra Chhetri and Indian Ambassador to Nepal Ranjit Rae, and Lt Gen AK Bhatt, DGMO Indian Army and Colonel of the Regiment 9 Gorkha Rifles, among other Indian Army officials. Year 2017 marks the bi-centenary of 9th Gorkha Rifles for which similar events are being organised at many places in India, but the commencement of the entire celebrations have been done from Nepal. The 9th Gorkha Rifles has five battalions and its history dates back to 1817, when it was first raised with Gorkha Volunteers as a ‘Local Levy’. The Regiment has distinguished itself in many battles and campaigns in the World Wars I and II, and all the battles fought after Independence. On the occasion, the veterans witnessed a special performance by the brass and the pipe bands of the 39 Gorkha Training Centre, Varanasi. War widows and veterans were felicitated on the occasion with financial assistance in the form of gifts such as sewing machines, wheel chairs and cash incentives. The event culminated on a high note with a sumptuous Barakhana organised specially for the ex-servicemen and was widely appreciated by the veterans with overwhelming response.